One night a few years ago, Yunos Bakhshi and a small group of friends drove out in the darkness to a field about 15 miles from Kabul. 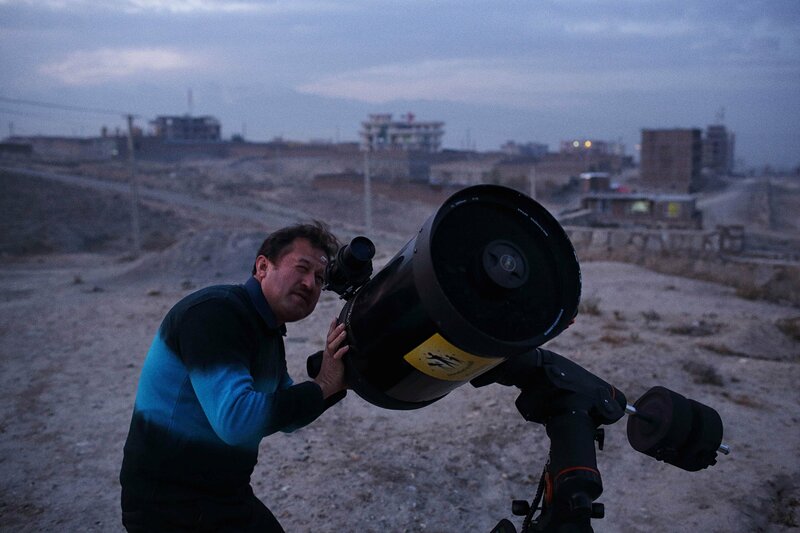 For the Afghanistan Astronomy Association, it looked to be the perfect night. They had been assured the field had been cleared of land mines, and the Taliban weren’t usually active in the area. Illumination from Bagram U.S. military base blazed in the distance, emanating an annoying level of light pollution, the astronomer’s most common enemy. But the sky was otherwise dark and clear; good enough conditions to observe the Messier 4 star cluster from their modest telescope. Bakhshi and his friends lit a barbecue and began to align their tripod-mounted telescope to locate the bright mass of stars, found in the Scorpius constellation. After a few minutes, they noticed a car’s headlights bumping toward them across the field. Suddenly, the group was surrounded by agitated police officers, guns pointed. In most of the world, an amateur astronomer can drive to a dark place, set up a telescope and enjoy the beauty of the sky above. But in Afghanistan, a country plagued by 36 years of war, a few men gathered around a telescope pointing toward the sky, in the middle of nowhere, looks pretty suspicious. From a distance, the police thought the telescope might be a rocket launcher. After careful inspection, the police still couldn’t comprehend why anyone would sit in a field, in the cold, to look at stars. Although they’d never seen a telescope before, they conceded that this probably wasn’t a weapon. Afghanistan’s war has taken a devastating toll on civilians: death, displacement, poverty. But it also affects lives in unexpected ways. For the country’s small band of amateur astronomers, exploring the universe’s deepest corners is a risk they now rarely take. The increasing encroachment of the Taliban, criminal gangs and aggressive police checkpoints means they now limit observations to the outskirts of Kabul city or their rooftops. 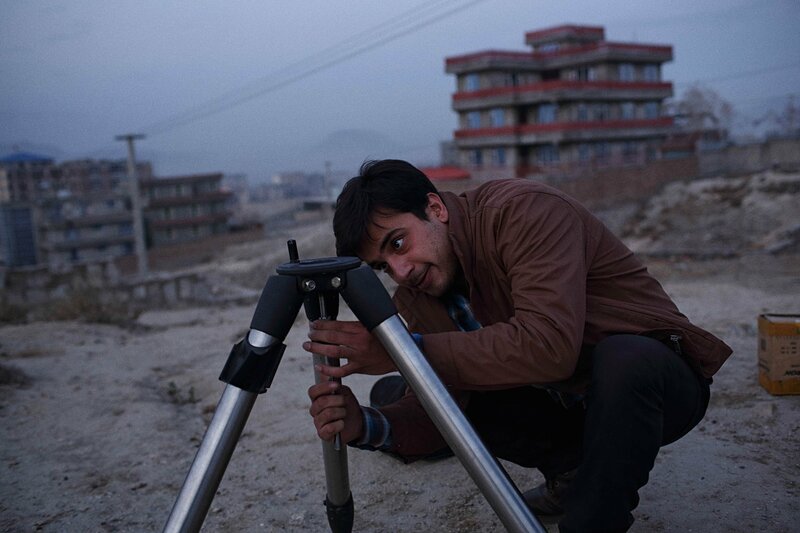 “The places where there are the darkest skies, almost all those places are insecure,” says Ibrahim Amiri, 26, one of the youngest members of the Afghanistan Astronomy Association. 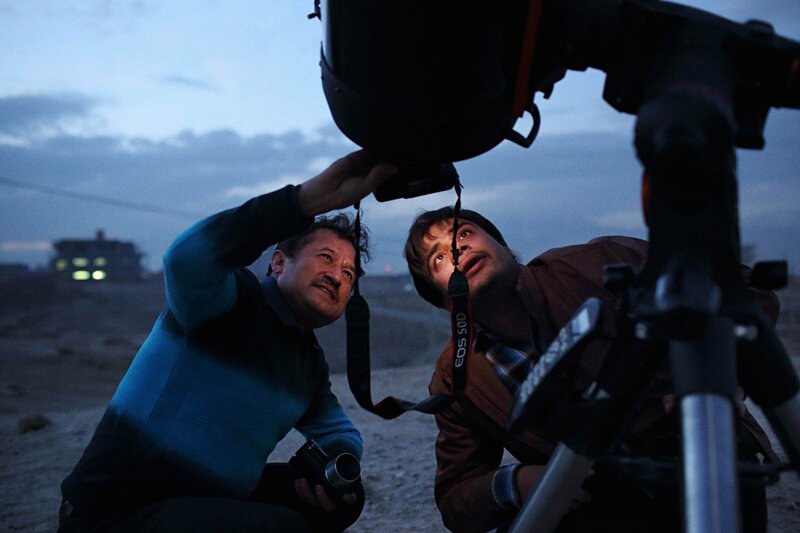 The majority of people in Afghanistan don’t understand even the basics of astronomy. Celestial events often feed superstition or are explained through astrology. When Bakhshi went to the Ministry of Justice to register the Astronomy Association, an official held out his palm and asked him to read his future. Mohammad Naser, a taxi driver, says he also prays during eclipses, at the advice of his local mullah. “We must pray so Allah will return the moon,” he says. Pregnant women are often advised not to touch their faces during an eclipse, as it could result in a birthmark on the child’s face. Another common superstition warns that a pregnant woman who touches a knife during a cosmic event, such as an asteroid passing, risks causing disability or malformation to her unborn child, such as a cleft lip. During Europe’s Dark Ages, Islamic civilization bounded ahead in both astronomy and physics. Muslim astronomers built observatories all over the Islamic world, refined and revised Greek astronomical theory, and they made breakthrough improvements to astronomical instruments, all of which has had a major role in shaping modern-day science. “For many educated Muslims, the Koran is not to be read as a book of science," says Nidhal Guessoum, an astrophysicist at the American University of Sharjah in the United Arab Emirates. Rather, its aim is “to point to God’s glory and purpose behind his creation.” However, Guessoum says, conservative views have at times interfered with science’s acceptance. “Ever since science started to reveal some aspects of nature or the universe that were in disagreement with traditional views, some conservative Muslim scholars have cautioned against the scientific theories or results that do not fit with that traditional picture,” he says. Bakhshi firmly believes astronomy expands personal horizons, creates empathy and combats radicalism. 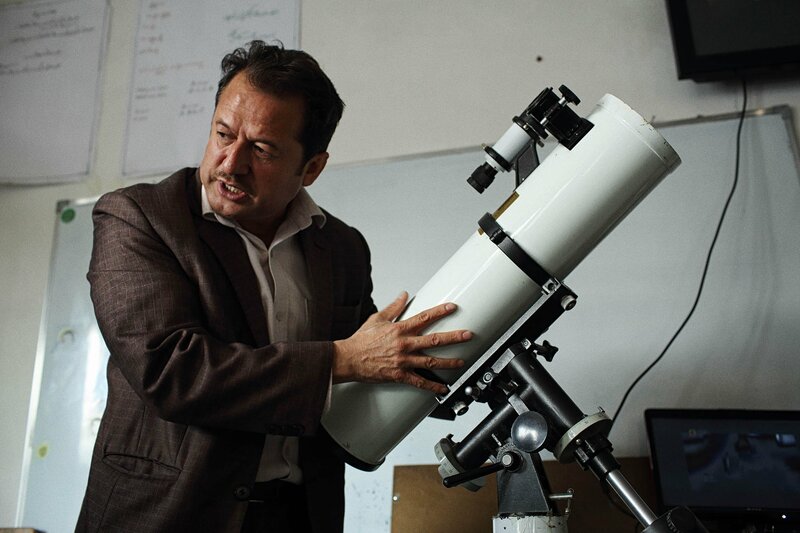 On a recent Saturday morning at Kabul’s Marefat High School, Bakhshi paid a visit to inaugurate the school’s very first astronomy club with the donation of a telescope. The class was besotted. 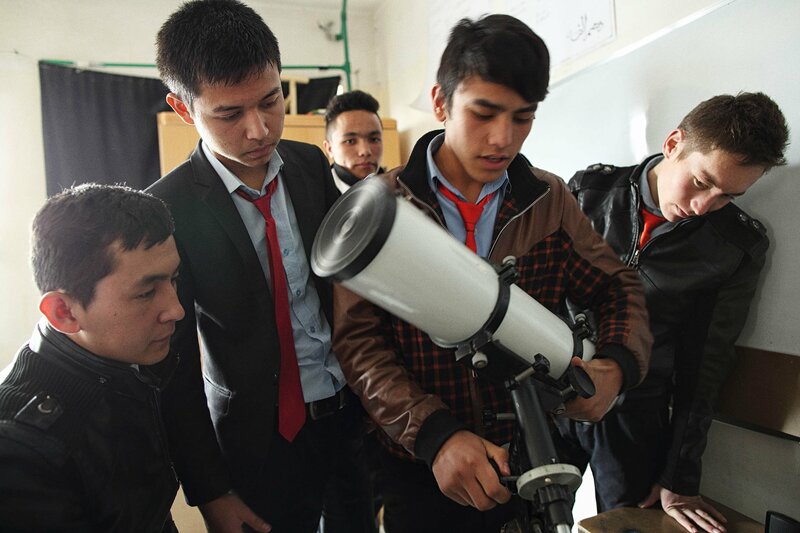 Usually, the presence of a foreign photographer would send Afghan teenagers into fits of giggles, but on this day they were intently focused on Bakhshi’s explanation of how to use the telescope. On another late afternoon, as the sun disappears and the evening call to prayer echoes across the city below, Bakhshi, Amiri and a small group of men gather on the outskirts of Kabul. As he sets up a large telescope, cigarette dangling from his lip, Amiri recalls the first time he saw the moon up close. In an old schoolbook, he had discovered a guide to making a telescope and managed to fashion one out of an old chimney pipe. “I couldn’t move my eye away from the telescope that night,” he says. One by one, the men peer at the moon through the telescope. The clarity is remarkable; the moon luminous and rugged with craters and mountains. For those who are looking through the telescope for the first time that night, each has the same reaction: astonishment and wonder, followed by a barrage of questions. When initially seeing Earth from space, some astronauts have experienced what is known as the “overview effect,” a cognitive shift in awareness. They suddenly see our planet as a tiny, fragile ball of life, and at that moment, national boundaries vanish and conflicts seem insignificant. In Afghanistan, a country where strife and disappointment never end, and suspicion of the unfamiliar is rife, that perspective of the vastness of the universe is important, says Bakhshi.